Lightningstar-a swift yellowish tom cat. he was the first leader of LightningClan. He brought wisdom and courage to his Clan. He is remembered by all cats as one of the best. He lost his last life in saving his clan from Twolegs. Foxstar- The first leader of FoxClan. He brought loyalty and cunning to his Clan. While he ruled, FoxClan lived in peace, rarely fighting. He now watches over his Clan with care, hopping they will stand to live another day. Waterstar-A silver she-cat with a strong heart and a passion for fighting. She was not blood thirsty, simply ambitious to show how strong her Clan was. She was the founder of WaterClan and brought strength and ferocity to her Clan. Sparkstar- Sparkstar was the founder of SparkClan. Her eyes were the color of sparks. She was quick and silent, and revealed very little at Gatherings. She lead a mostly peace-full Clan, but when a cat from another Clan stepped foot on her side of the border, she attacked them savagely. She mostly keeps to herself. Applesky-Applesky was a brave warrior of WaterClan. He died in a battle with FoxClan. He was honored by all cats, and was respected. He was a very good cat, and would never break the code. He watches his Clan with care. Vinepelt - a light gray she-cat with green eyes. She is good natured and friendly. She hates her father and mother, Dragonstar and Gurgleclaw.Their blood stains her claws, and she had to prove herself over and over again to show she did not believe in their murderous ways. She died of greencough. Quickclaw - a black and white tom cat with green eyes. His tongue was cut out in the battle his parents died in. He was the fastest cat in FoxClan at the time, lashing out at his enemies with almost no mercy. He killed to please his parents, but each time part of him cried inside. After they were gone, he became a medicine cat to make up for his crimes. Midnightstar - Is a sleek black she-cat with green eyes. I am very fair, very loyal, and protective of my clan. im a tiny bit hostile on the outside, but very gentle and kind on the inside. It is a struggle for me every day to try and keep my Clan together, and sometimes it feels as if everything is spinning out of control.She killed herself, taking away her last life because she thought she was destroying the Clan. Dancingshadow- a beautiful slender black she-cat with blue eyes. She was a WaterClan warrior and on her last patrol , died from a sneaky fox which had sneaked its way into WaterClan's territory. Days, maybe even two weeks before her death, she saved a kit of SparkClan on the Thunderpath. She fell in love with that same kit, a kit named Lightningkit. She is extremely loyal to WaterClan, gentle, kind, loving, fierce in combat and wise. Lunarcrest- Lunarcrest is a beautiful, slender light gray...almost white tabby she-cat with dark gray tabby stripes and brilliant sky blue eyes. She was born with two brothers, but they were both brutally murdered, along with her parents. Her older brother, Ashstorm, from a different litter, took her under his wing. Robinwing- He is a brown tom with dark tabby stripes and pale green eyes. With white paws. He was murdered by a badger. When the badger leaped at Silvernose, he threw himself in the air to save her. He wishes he was with his family. Nutshell- I'm a dark ginger tom who is loyal to the bitter end. I was killed by Fawnstripe's brother, Horsenose, after i got him to go to FoxClan to steal back a frog i caught. Formaly Nutkit he was given a warrior name by Gingerspark so that he may be honored as one. Blackfrost-Handsome smooth pure black tom, with clear green eyes. He is very strong and muscular. He is also very arrogant and defensive, but a very loyal clanmate. He wants to be the best warrior anyone has ever seen. Died of greencough. Sunclaw- A handsome dark ginger tom, with white underbelly, paws, and amber eyes. He is nice and caring. He is very wise and usually stays away from others. He is an excellent fighter. He has long legs and claws which makes him a fast runner and hunter. He has very powerful muscles and is big and strong. He is also charming, loyal, brave, determined, and can be stubborn. He died saving Stormpaw from the river. Forestblaze- A young, handsome, silver tom with forest green eyes. He is caring, smart, funny and honest. He is very swift and an incredible fighter. However perfect he may seem, Forestblaze has a tendency to go overboard in any fight, not knowing when to stop. But on top of it all, Forestblaze is the kind of cat who you can instantly get along with; a best friend. Mossclaw- A small brown tabby she-cat with yellow eyes. Mossclaw is a loyal LightningClan warrior, swift of foot and a fantastic fighter. Though she's snappy and rather crude when you first meet her, look deeper and you will discover a soft center that is caring and loving and understanding. Loyal only to her clan and the warrior code, she is not one to ever break a rule or not follow instructions. Silksong killed her. Wolffrost- mysterious, clever. He is a great hunter. He's quiet, serious, intense, very wild, and not easily tamed or impressed by others, very independent. However he can be very loyal to close friends. Runningstar- Runningstar is fierce and loyal. He is a strong leader and defends the code. he will lay down all his nine lives for his clan, and think nothinng of it except that he is saving the Clan. I believe strongly in Splashtail and know she will one day be a great leader. 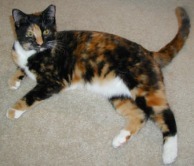 Dapplenose- A pretty tortoiseshell she-cat with green eyes. She is fast, and loves to bask in the sun. When she's not hunting with friends, she's usually off patrolling with her best friend Splashtail. She hopes to be one of the best warriors FoxClan has ever seen. Coalpelt- a fluffy gray tom cat. He likes to hunt a lot, and enjoys running in the sun. When he was a kit, he almost ran onto the thunderpath, but Runningstar caught him just in time. He really likes Dapplenose, and really wants to be her mate in the future. When it comes to battle he is transformed into a writhing spitting rage machine that attacks brutally. He trains his apprentices to never show fear, to always be strong in the heat of battle. He has a harder side of himself, one he rarely shows unless angered. Hawkfang- I am always willing to help. When I was an apprentice, Earthpaw helped me with some of the herbs. Cats say I am a bit on the curious side. But I can't help it. I have a crush on Splashtail. But I know I'm not supposed to mate. I sometimes have little visions in my head. Red-Eyes-an interesting black she-cat with red eyes. no one knows how she has them, but no one really cares now. except the new dead cats who have never seen her before. She dies trying to cross the river when it was to ohigh and drowned. Leopardnose-a very strong tom cat with hard eyes. He was strongest cat in the Clan, and tore his enemies apart. However, he has a very sweet side, and his mate Fernfrost brings it out in him. He died trying to save Red-Eyes. Firesnout - I am a fierce warrior of SparkClan. I stand by the code and will stand by it to the bitter end. I am a blazing orange tom with brilliant blue eyes. I love my mate Poolwing. I died from greencough. Runningwind- A sleek brown cat with sharp eyes and swift moves. He is very fast and cunning. He doesn't talk much and keeps to himself. He wont talk to anyone. You'd have to drag it out of him. He often secretly feels lonely and rejected from the Clan. He tries his best but cats just seem to ignore him. His father and mother never really spent time with him. Neither did his sister Cloudfur. Maybe that's why he's so antisocial. He died from greencough.